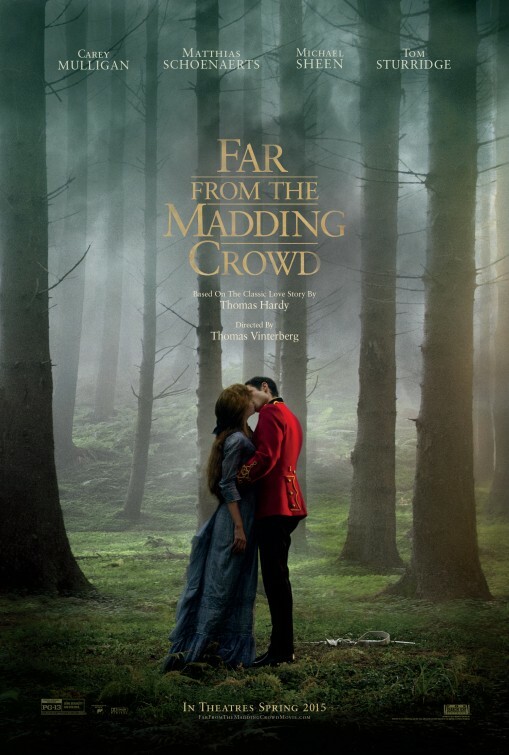 Thomas Vinerberg’s “Far From the Madding Crowd” is an unnecessary but unusually handsome adaptation, executed with enough artful wit to still feel fresh. A troop of terrific actors are led Carey Mulligan as Bathsheba Everdene, and the feminist bent of her character makes this period costume drama germane to our times. 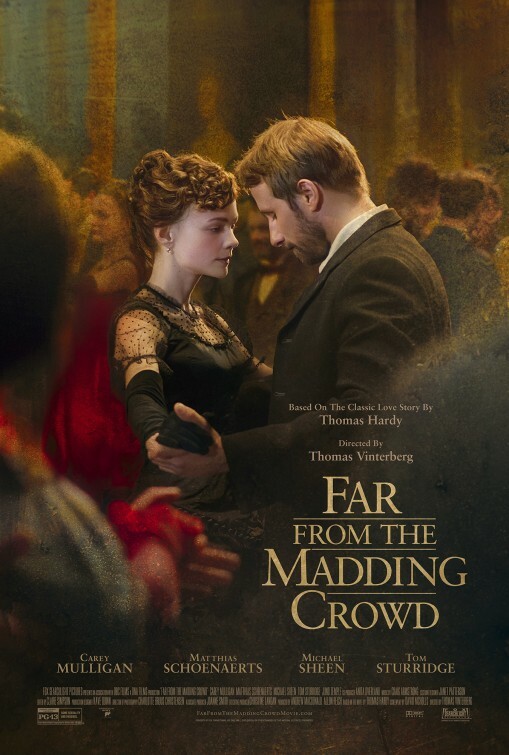 But “Madding Crowd“ lacks the fiery passion that modern audiences are accustomed to, and the lax, deliberate pace may provide a monotonous, sour experience for the uninitiated. But there are treasures here, and if you’re willing to spend the effort to dig them up “Madding Crowd” proves to be a rewarding experience worth exploring. Bathsheba Everdene is an independently wealthy woman who is, herself, fiercely independent and in her own words, in need of taming. She deems no man worthy of the challenge, and over the course of the book (and so the film’s) timeframe, three men, personifying the three varying ideas, propose to her in marriage. She says no to at least two of them, and how the complexity of the narrative gradually builds is one of the film’s pleasures. She inherits a vast property previously owned by her parents, and while it has not fallen to ruin, it is in much need of tighter upkeep. Reshaping the present for a better future is a thematic throughline present in many of the story’s settings, characters, and indeed even the plot itself, and the push for a more magnificent estate mirrors Bathsheba’s own hope for a better future. Not just for her, but for women. The first suitor is the rugged farmer Gabriel Oak (Matthias Schoenaerts), who as his name heavy-handedly reveals, symbolizes the natural world. He owns a farm adjacent to Bathsheba’s, but amidst courting her his farm falls to ruin and he’s forced to relocate. Rigorously hard-working and an honest man, he is the easiest to root for. The second is William Boldwood (Michael Sheen), an extraordinarily wealthy but rigid man lacking, amongst other personal qualities, a sense of humor. The third is the sensual Sergeant Frank Troy (Tom Sturridge), whose impetuous charm amusingly captures the artificial allure of foreign intervention. This is a better story than one where each of these three men’s bids for affection is siphoned off, and how they interlock and slowly come to a confrontational boil is when “Madding Crowd” entertains most. Allegiance becomes a fraught over thing, and how they behave not only with Bathsheba but between each other reveals their character. As an example of early feminist lit, Thomas Hardy’s 19th century classic couldn’t be more relevant. Hardy’s well-observed plot merges a complex romance narrative into vital social allegory, brought to fruition through the power of symbols. In the same way “Citizen Kane” uses a certain object as a metaphor for lost youth, “Madding Crowd” finds meaning through colliding social forces. There are three different ways of life represented in the three main suitors, personifying differing ideologies, histories, and futures. A military man evokes a heritage of false-footed colonization, another suitors shows the bitter success of capitalist enterprise (the same idea that inspired Ebenezer Scrooge in A Christmas Carol), and the last, Oak, celebrates nature. At times “Madding Crowd” resembles a courtroom drama, and as Oak, Boldwood, and Troy take turns pleading their case, we inhabit the opposing roles of character witness and jury. That Hardy left it up to a woman to determine the victor was of enormous social significance in 1874; he put woman’s status on the same pedestal of that of a man’s. There’s a purpose too beyond the political, using the motif of the “Earth Mother” to compliment and contrast Bathsheba, making this a curious example of early ecofeminism. Much of Hardy’s focus is on the natural world, and writing Bathsheba as a woman unafraid of getting dirt under her finger nails inexorably connects her to the Earth. But in turn, her apprehensiveness to start a family defies her “Earth Mother” status. Mulligan, who previously played a submissive love interest, a filthy mouthed folk music singer, the most beautiful woman in the world and a hard on her luck but pretty sister in need of cash, continues to dazzle with range. Playing a boldly independent but still feminine woman isn’t an obvious choice based squarely on her roles so far, but she inhabits Bathsheba so effortlessly no other choice could possibly come to mind. Acting is such a nuanced, natural seeming thing for Mulligan that calling this her best performance might overstate it; a second or third viewing of a previous film may reveal layers to an earlier role that were previously unseen. 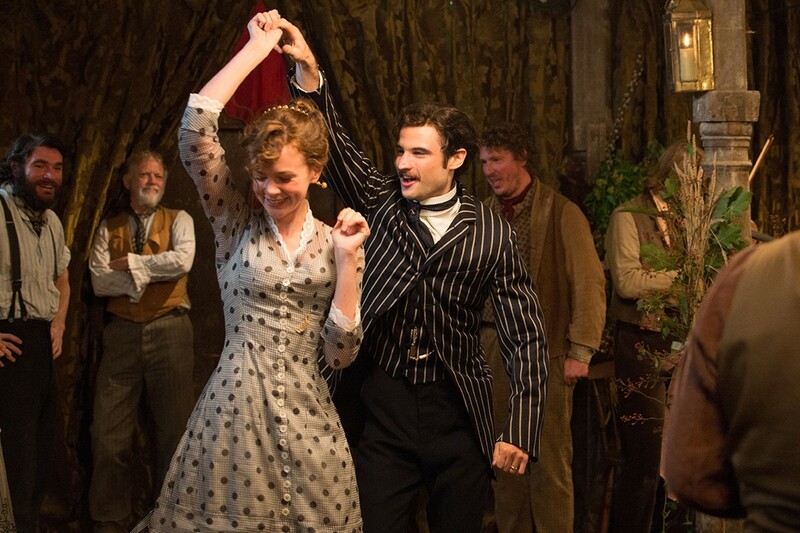 So while “Madding Crowd” is well cast from top to bottom, Mulligan runs the show, and with a performance that shows strength and vulnerability simultaneously with the slightest change in posture or voice level, watching her is the film’s most worthwhile quality. If Mulligan is the film’s finest asset, Thomas Vinterberg, famous for the radical 1990s film movement”Dogme 95″ and 2013s acclaimed “The Hunt”, is certainly its second. He relishes in the complexity of the text. A lesser director might have pruned layers of subtext into a streamlined soap opera of emotional hysterics and crying and yelling, but this version has loftier goals. Things are kept at a restrained, believable cool, making for a deceptively quiet atmosphere that lets emotion mature naturally. Unlike most other recent romances, every tear, every heartbreak and every evolution is earned. Embellishing the visual subtext of the book injects “Madding Crowd” with an often overlooked element of literary adaptations—the visual style is equally as thematic as the sentences of a symbolic description. When Bathsheba aims a gun at two birds and knocks one out of the sky, a suitor (one of two, at that point) that she’s clearly not currently interested in approaches her. During a moment of romantic ecstasy, the sky glows with the same blue of her dress, as though it too is enamored with this strong-willed, beautiful woman. The painting-esque, pastoral visual palette heightens the natural world Bathsheba lovingly inhabits, making it another example that while the halted pace detracts, Mulligan and Vinterberg give us much to enjoy.